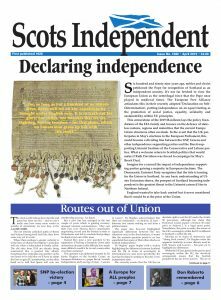 When I was 6 my wee brother was conveyed in a Cumfifolda pushchair with a big tray underneath it curiously of the most perfect shape to accommodate Scots Independent papers and SNP election leaflets. My mum, my brother and I pounded the streets whinging those missives through letterboxes of big posh houses and more modest council homes. We lived in Crieff, caravan dwellers, probably the sort of folk that others thought didn’t deserve a vote; likely we were regarded as illiterate leeches who made a living from stealing and selling scrap or telling fortunes in palms or tea leaves. I’ve explained before about the brave expeditions by the valiant missionaries of the Baptist Church who came to save and civilise us; they could barely believe that vagabonds like us could read, write, rationalise and understand the machinations of the wider world. I’m reminded of their shock tonight as I watch IDS express his surprise at the voting pattern of the people in what he described as the housing estates as if those citizens were somehow lesser and unknown beings devoid of intelligent or rational thought. I recall the teacher who expressed surprise at learning my address – she said she didn’t realise I was one of those traveller people. She was wrong there, but I had wished I was such. Sometimes folk who should know better just don’t understand the wider world or their place in it and when it impinges on their comfort they cannot react appropriately. That caravan of ours housed a radiogram which on one particular Hogmanay in the late 1960s blasted an anthem the like of which Scotland had never before heard – I crept from my bed to listen; I watched in awe the women in mini skirts drinking Babychams and Advocaat, smoking coloured Sobranie with gold tips, as their men in polo necks or flowered shirts lined up tins of Sweetheart Stout and argued about who was the best looking model on the can. Changed days. But that record, a wee 45, was played over and over into the night until they were all word perfect. I can still hear and see in my mind’s eye those men with their sideburns as they punched the air and cried how we can still rise now and be a nation again. And I just knew how right they were. There have been many campaigns, much joy and floods of tears since then. We saw our pits turn idle, steel works closed, car plants shut down; The Proclaimers set it out so well. But there have been high points too – we have won workers’ rights, women’s rights and human rights; we forced Westminster to concede devolution which would kill the SNP stone dead; we’ve become more equal, we have LGBTI equality and recognition; our NHS is protected and now we’ve in John Swinney a champion for Scottish education who will leave no stone unturned. We have marched against illegal wars and sought to save refugees and provide safe haven for them. As a nation, we have leapt forward in terms of our expectations for ourselves and what we can give to the world. I’m looking back over almost 50 years and tonight I like what I see. There has become built within our land an unbeatable network of freedom fighters, we fall in and out with each other but we never give up, no matter what. We have Women for Independence, Yes2, IndyRef2, and regular events donating to food banks. I’m not giving a stuff about once in a lifetime or once in a generation or any other similarly lame excuse for denying the right of a nation; there has become a democratic outrage which can be put right only by the further grant to those who choose to make their lives within Scotland of the opportunity to vote for Independence – nothing less will do; this time it’s serious, it’s business and it’s personal. This piece was written back in 2016 (in case any of you are confused by IDS reference)by Eva Comrie, but still relevant today in the way people are treating each other. Next Post: Awa wi’ the yella simmets!